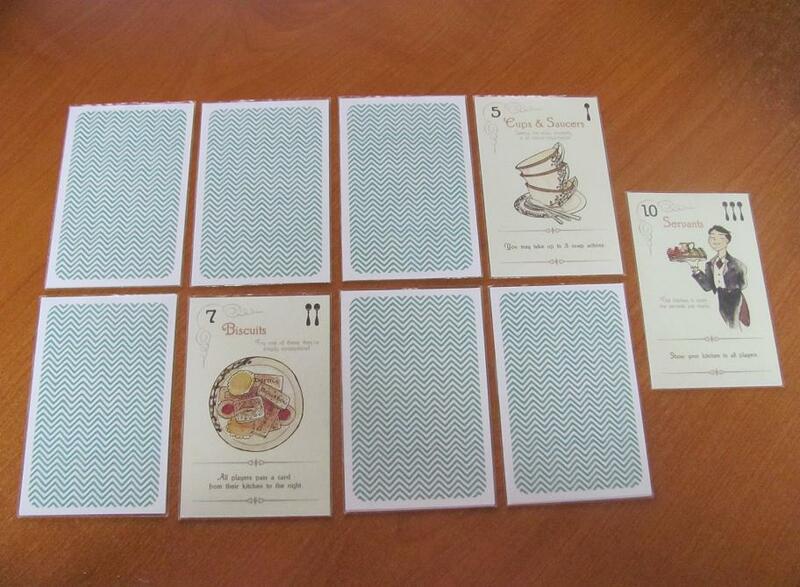 Elevenses is a card game in which players try to outdo each other at hosting morning tea. Currently seeking funding on Kickstarter, Elevenses is a game that feels just right for a tea party—interesting, thoughtful, and interactive but not too heavy. It also makes the most thematically-fitting use of wooden cubes that I’ve seen yet. The recipe for Elevenses balances a little strategic decision-making with a dash of take-that and a hint of memory-game. There are just a few different cards and all players start with the same set. Thus, card-play is mostly about timing. Each round, eight cards are randomly placed faced-down on the table in two rows of four—this is a player’s tablecloth—and three are left for the hand—called a player’s kitchen. In addition to its instructions and position number, each card has a teaspoon value. At the end of a round, which is when one person plays a number 11 card, the one with the most face-up teaspoons takes two sugar cubes (wood cubes painted white) and the one with the second-most takes one. The first to seven cubes is the winner. Two cards, the number 1 (“Tea Trolley”) and number 10 (“Servants”), are actually played without retrieving new cards from the tablecloth to replenish one’s kitchen. Yet, they’re also the most valuable—one is worth 3 teaspoons, the other automatically gives a sugar cube to the one who played it. The challenge with them, then, is to balance teaspoon-value with flexibility. Similar tradeoffs in the game exist between playing for high teaspoon-value or playing to end the round early, manipulating the cards of opposing players or focusing on one’s own cards, and playing opportunistically or strategically. In any case though, rounds end quickly, providing lots of opportunity to adjust play and adopt to the styles of other players. Supporting Elevenses on Kickstarter at just $20 Australian includes a copy of this cute little social game shipped anywhere in the world.